11. Explain what is Cells in OpenStack? Cells functionality enables you to scale an OpenStack Compute cloud in a more simplistic way. When this functionality is enabled, the hosts in an OpenStack Compute cloud are partitioned into group called cells. Cells are configured as trees. 12. For networking, what hardware is used in OpenStack? 13. Explain how you can transfer volume from one owner to another in OpenStack? You can transfer a volume from one owner to another by using the command cinder transfer*. 14. What is the command to manage floating IP addresses in OpenStack? 15. What is bare-metal node and what does it comprised of? It gives access to control bare metal driver, through which you can control physical hardware resources on the same network. Bare metal node is comprised of two separate components Bare cluster. Bare metal node Operating System: It is a base software, which runs on each node in the cluster. 16. Mention what is the command to remove network interface from bare-metal node? To remove network interface from bare-metal node command used is bare-metal – interface remove. 17. Explain what is the function of Cinder Scheduler? 18. Explain what is Token in OpenStack? 19. Define Python Cloud SDK? For writing python scripts and managing in Openstack cloud, SDK (Software Development Kit) is used. The SDK implements Python binding to the OpenStack API, which enables you to achieve automation tasks in Python by making calls on Python objects instead of making REST calls directly. Most multinational organizations define OpenStack as the future of Cloud Computing. 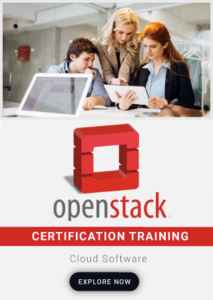 The Internet and large volumes of data together have instigated the purpose of cloud computing, and OpenStack is one such platform to create and handle massive groups of virtual machines through a Graphical User Interface. It is a set of efficient software tools to manage private and public cloud computing platforms. Openstack is free, open-source software and works similar to Linux.